Non-partisan watchdog group American Oversight today released official calendars received via FOIA documenting Education Secretary Betsy DeVos’ first six months in office. 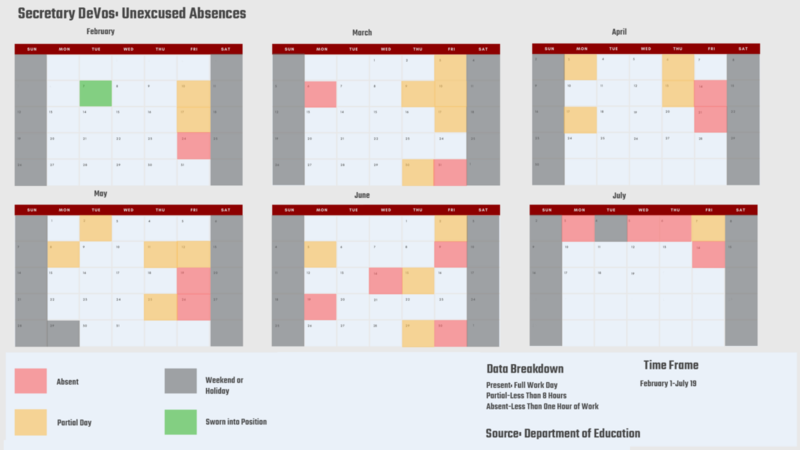 An analysis by American Oversight found that during that period – which stretches from February 8th to July 19th – DeVos only completed a full day of work 67% of the time. You can find an annotated version of Secretary DeVos’ calendar HERE. American Oversight is calling for the Department of Education’s Inspector General to investigate whether Secretary DeVos’ frequent absences have had an impact on the management of the department and whether adequate records of her work are being maintained. Calendars for other senior Department of Education staff can be found here. DeVos frequently worked less than four days a week, regularly leaving the office on a Thursday afternoon and returning late the following Monday morning. Secretary DeVos departs the Department of Education's offices at 3:30pm on a Thursday and doesn't return until 2:45pm on the following Monday - almost 96 hours later. DeVos’ personal travel regularly took her to luxury vacation spots, including Aspen, Vero Beach, and Savannah. Following official travel with the President to Orlando, Florida, Secretary DeVos departs en route Aspen, Colorado. She takes off Monday and returns Tuesday morning. Four out of twelve of DeVos’ official trips were to Florida, a state where she owns a vacation property and has extensive ties. Secretary DeVos finishes up work early on a Friday before heading to an Orlando Magic game. Both the Magic and the naming rights for the arena they play in are owned by the DeVos family. On days she was out of the office on personal travel, DeVos’ calendars show few examples of remote work. 15 work days have no entries for any official work. Secretary DeVos is out of the office for a 10-day vacation, during which she only conducts one 30-minute long call. On her 25 partial days, DeVos averaged less than four hours of work. On Monday, May 8, Secretary DeVos's calendar reflects less than 4 hours of work.